Before we get into the GSC, the Treacherous one was on hand this past Thursday when yours truly couldn’t be. And, of course, you listeners were in good hands. He laid it down like a baby after a feeding with some delectable tunes, both old and new. Check out the stream if you missed it or, understandably, need it again (link is replaced @ 2300hrs 09/01/11). — playlist posted live on Twitter. The Masquerade website informs that they have a special ‘2-day funk pass’ for the Dumpstaphunk/NMS shows on 11/10-11/11 for only $22. That is one funkin good deal if you plan on seeing both shows, which I’d recommend. That’s all for now. Sunday, August 28, 2011 | Posted in Electric Boogaloo | Comments Off on Georgia Soul Council’s Back! 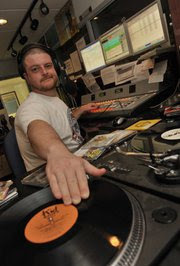 If you’ve listened at all to 88.5’s Soul Kitchen or been to any gig where funk music is being played in the past 10 or so years, you’re probably familiar with one (DJ Dr.) Adam Bomb. Well apparently Ga. State has allowed him to graduate which means his reign of terror at Album coming to a close. Check out his final shift on Monday August 15 which begins at 6pm with 2 hours of rotation and culminates in the final culinary explosion you’ve come to expect when the Bomb’s in the Kitchen Mondays from 8 to 10. Again, this isn’t the end of the Soul Kitchen, just Adam Bomb’s legacy there. Yeah, yeah, this is the infrequently updated blog of the Electric Boogaloo, but we are benevolent with our brothers in funk. I know it’s been a while, and I’m gonna quit promising to update this more often, so just deal with it and stay funky. You can always get our playlist fresh out of the oven on twitter, but here’s what we dropped last week. Ride the wave here.